Low haemoglobin decreases the oxygen carrying capacity of the blood. This is offset by the following mechanisms. Increased cardiac output: Tissue hypoxia causes peripheral vasodialatation and decreased haemoglobin decreases blood viscosity. Together these reduce peripheral resistance allowing a higher cardiac output without increasing blood pressure. Increased cardiac output increases tissue oxygen delivery but decreases the patient’s exercise tolerance. Increase in cardiac output is seen at haemoglobin values less than 7g/dL. Redistribution of cardiac output: Blood flow from non-critical areas like the skin is diverted to critical organs like heart and brain. Increased Oxygen Extraction: Anaemic patients have increased tissue oxygen extraction from the blood. This is not seen in organs like the heart and brain that already have high oxygen extraction. Changes in oxygen affinity of haemoglobin: Patients with chronic anaemia have increased of 2,3 diphosphoglycerate (2,3-DPG). 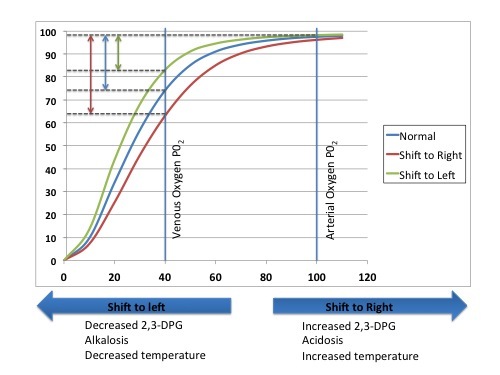 2,3-DPG shifts oxyhaemoglobin dissociation curve to the right and increases oxygen delivery. The figure above shows three curves. The blue curve is the curve of normal haemoglobin the red shows shift to left and the green shift to right. Shift to left increases the oxygen delivery. Isovoluaemic haemodilution: Patinets with anaemia have increased plasma volume. This allows maintaining a normal cardiac output.